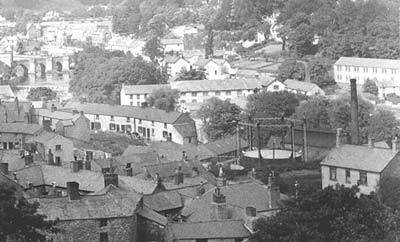 Over the years, Llantysilio and Llangollen have been the homes of numerous industries, primarily the manufacture of wool and flannel but also corn milling and brewing. The Romans first introduced the technology of the watermill. Corn Mills were clearly important because the grinding of grain was essential to life. Only in the late 19th century did the watermill begin to disappear from our towns and countryside. Sadly, all of the mills are now silent or converted to other uses and the breweries are dry. The principal industry of Llangollen and Llantysilio is now tourism. Llangollen Mill was a corn mill originally built by the Cistercian monks of Valle Crucis and is mentioned in a 13th century document dealing with a fishing dispute between the freemen of Llangollen and the Abbot of Valle Crucis. The mill was re-built in 1786 mainly of local stone. At the end of the 18th century John Jones was the miller, marrying in 1795 Mary Bowen of Dinbren. John Jones died in 1812, but in 1830 a Thomas Jones is shown as miller in Llangollen – whether he was a descendent is unknown. In the 1840s Edward Owens occupied the mill, followed by Samuel Parry in the 1850s and early 60s. The family firm of William Jones and Son took over the mill in 1864 and the mill was used solely for grinding corn until 1895, when changing times and conditions necessitated the decision to become a provender mill. The mill continued to operate for another 80 years, finally closing in 1974. The property remained within the Jones family for a further 20 years or so, during which time it was leased to Llangollen Weavers and later to an antiques showroom and gift shop. The Corn Mill then became a restaurant and pub. Pentrefelin Mill was the medieval corn mill of Valle Crucis Abbey. It was recorded in 1596 in documents relating to land previously belonging to the Abbey and in 1606 was rented to Richard Mathew. 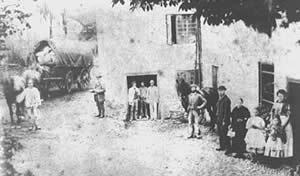 Rebuilt in 1702, census records show that in 1891 the mill was worked by Thomas Jones, Miller, and his wife and William Hughes aged 14 years, a mill labourer. In 1987 it was restored and converted into a family home. Inside, some of the workings remain in situ. 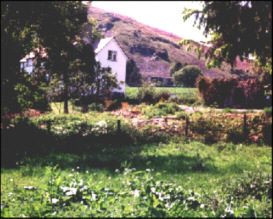 With it’s leet, mill pond and overshot water wheel, Melin Eglwyseg was typical of many thousands of small upland mills which once existed in Wales. The prefabricated cast-iron parts demonstrate the central role of water power in the early industrial age. 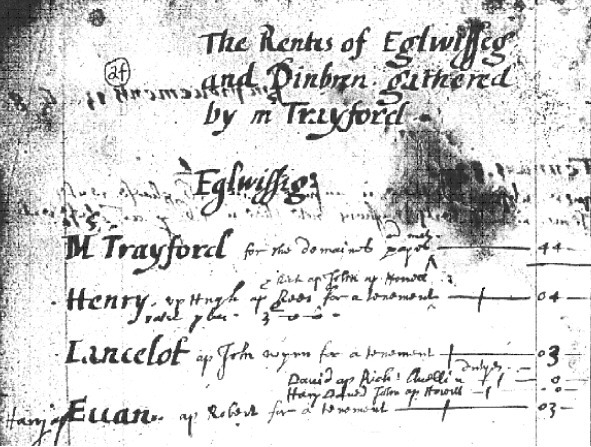 As early as 1626 rental records for the Wynnstay Estate list an M. Trayford as paying an annual rent for 'the domain and mill' in Eglwyseg. The mill was a flour mill that remained in operation until the end of the 19th century. Now a private house the mill wheel remained on the end of the building until the late 1960s when it was torn off in a storm. 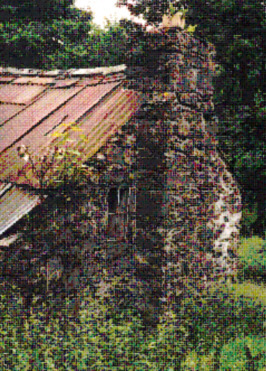 The corn mill in Rhewl belonged to the Edwards family in the middle of the 19th century. 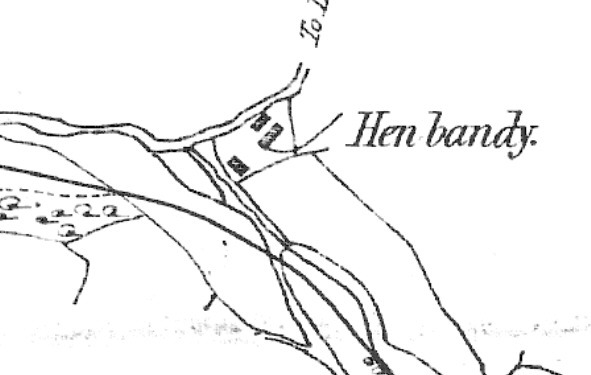 However, the dam and the reservoir that fed the mill appear on an estate map of 1783, indicating that the mill had been in use for at least 70 years prior to this. The dam was 12 feet high and the remains of the stone walls still bear witness to an impressive feat of engineering. The other traditional use for mills in Llangollen and Llantysilio was in the wool and cotton industries. The original mills were the Pandai or Fulling Mills, used to strengthen wool before it was made into clothing or blankets. Cleaning and stabilising cloth was an important activity in medieval times. Cloth was beaten in a water and clay (Fullers Earth) filled trough and stretched tightly on tenter frames to bleach in the sun. 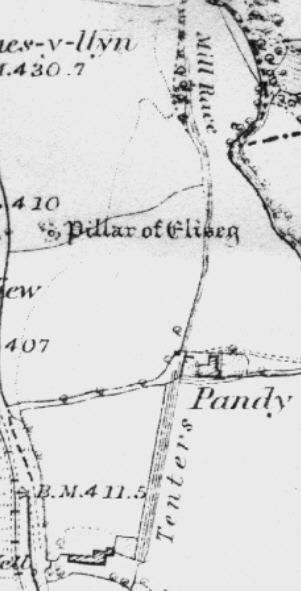 The Cistercian monks of Valle Crucis undoubtedly brought with them an increase in the use of wool and there are at least two old Pandys to be found in Llantysilio. 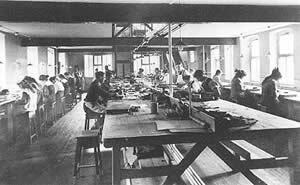 The increase in demand and the industrial revolution brought larger scale operations to Llangollen with the development of the Dee Cotton Mills in 1805 and Mile End Mill. Pandy is a 20th century building adjacent to the site of the original fulling mill of Valle Crucis Abbey. A ditch/leet was dug (the line of which can be seen), diverting water from Nant Eglwyseg to power the mill wheel. Rental documents from 1606 refer to the fulling activities. Fulling continued after the monks left, with census records from 1841 to 1871 showing occupation by fullers. 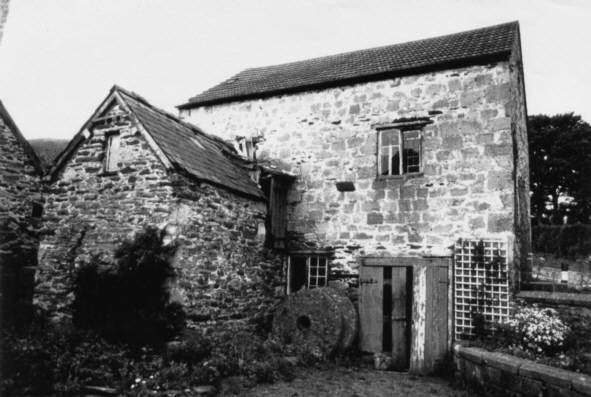 Hen Bandy (Old Fulling Mill) can be identified in the records of 1719 but even at this time it was referred to as the Old Fulling Mill, so it is likely that the history of this building goes back even earlier. In fact a medieval spindle whorl was found on the site. 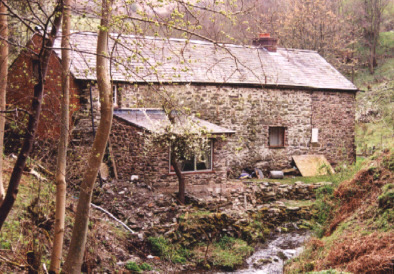 Until the middle of the 19th century there was a third building at Hen Bandy, adjacent to the stream, undoubtedly the original Mill. Cotton came to Llangollen in 1805 when Lower Dee Mill was built, but only lasted 30 years as slumps in the trade caused successive bankruptcies. The prospering wool trade with it’s mechanical looms took over and the Mill was bought by Hughes and Roberts in 1835. They expanded into the Upper Mill in 1855. Both remained in production until 1921 giving Llangollen a 130 year connection with the trade. The site was later occupied by Cuthberts seed merchants. Mile End Mill after a fire that happened shortly before Christmas 1907. 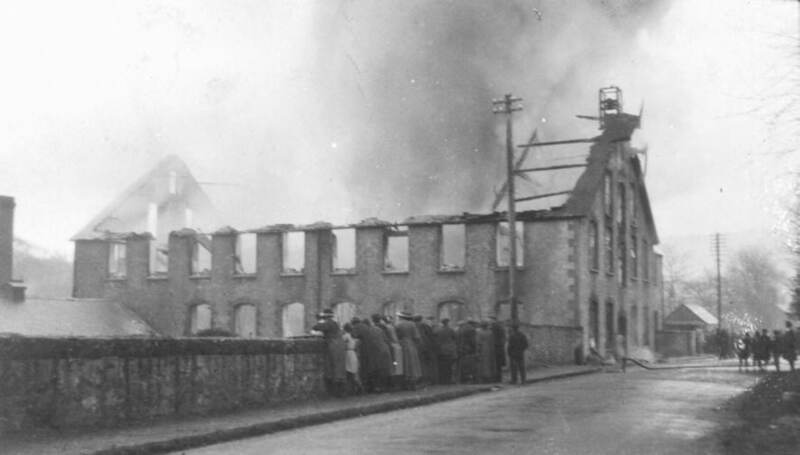 Another fire at Mile End Flannel Mill occurred in 1920. It was attended by both Llangollen and Wrexham Fire Brigades. The owner S. Lloyd Jones lost £33,000. in 1990. Many were not sorry to see it go as the process generated a smell that was not pleasant. 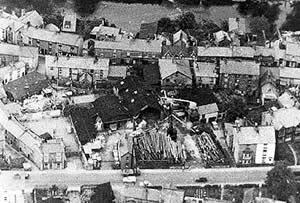 It is not known exactly when Coward's timber yard first opened, but by 1891 the business was thriving. 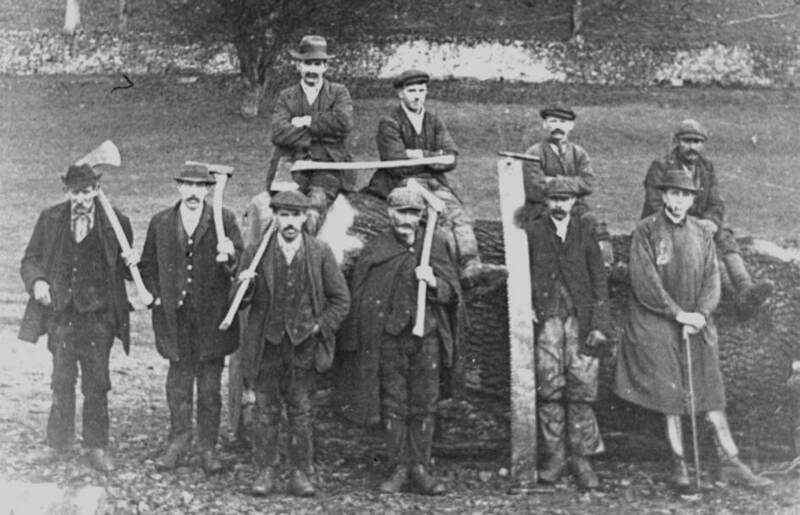 Shown on the right is part of the workforce of Coward’s Timber Company. Mr Tom Coward, the owner, is on the extreme right. The business continued until the 1950s (aerial view left). After closure the buildings of the timber yard were empty for some time before being demolished. Today the former timber yard is the site of the Kwik Save supermarket.